This distant view picture is simply awesome and showing the mosque from some distance. Selimiye Mosque is beautiful mosque situated in Edrine, Turkey. 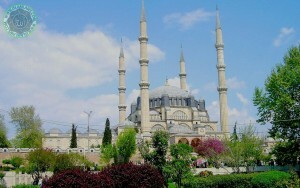 The beautiful mosque has four high minaret and one central doom. Here in this photo gallery we have designed some latest wallpapers of this beautiful mosque.